Follow Me on my Quest to "Createness"
Growing up in a small town bordering the US, and my husband’s mother being American, we usually celebrate both Canadian and American Thanksgiving. During the months of October through December, I do plenty of baking and much of this baking contains pumpkin. I have been making and using homemade pumpkin puree in my pies, breads, whoopie pies, cookies and muffins for nearly 20 years. October brings back memories of when I would take my children to visit my Grandfather at his home just outside of St. Stephen, New Brunswick. In the late 90’s we moved to Halifax, NS. We made many trips home each year, yet the ones that stand out to me are those trips that were made in the fall to that small town we still call home. My Grampy, Vincent was like my father, he gave me away and our wedding. I didn’t know my biological father, but never felt like I didn’t have a father. He made sure of that. He was a wonderful man who touched my life in so many ways. He lived a modest life, with no cares for more. I love that about him. He was a smart man with many talents and one of them being that he grew and maintained a large, rustic style garden filled with a great deal of fruit and vegetables. Many of those plants were planted from heirloom seeds that he collected, some of which were pumpkins of different varieties, shapes and sizes. I can imagine he would have won many a ‘Country Fair Blue Ribbon’ for those pumpkins, had he ever entered one. Chelsea and Cameron would be excited to go home with the huge pumpkins that he had so lovingly cared for and grew just for them. As well, he would have a box overflowing with baking pumpkins, zucchini, carrots, cucumber, tomatoes and always a wildly beautiful arrangement of flowers for our journey back to Halifax. His garden had a simple beauty to it and I always felt at peace when I would wander through it with him. His humble home, amidst an ever-changing fall foliage, the amber glow of the sunset, and the rich colours of his substantial collection of Dahlia’s, will be forever painted in my memories. I find myself wishing for a Dorothy moment if only to be swept away and taken back to spend a few moments with him. Even so, if I close my eyes right now, I can be swept there in an instant. It’s a beautiful sunset and we are cloaked in rays of its warmth as we stand amongst his flowers. It’s an unusually warm night for October in the East Coast and I can hear his voice. It’s soft, gentle, yet loud enough to carry over the seemingly eternal hum of the honey bees and an orchestra of crickets in the background. I am hanging onto his arm, it’s covered by a plaid jacket and he has red pants on. Both are slightly worn, and have collected remnants of the earth from a days work in the garden. I lean in, my nose detects scents of the earth, musk from the heat of the day, gasoline from his hours spent cutting wood, and sweet notes of the field behind his home. We walk together, I look up, his face, weathered from the years, has a slight glistening glow from his grey whiskers, his eyes are soft, and he is smiling. He is finding amusement at the conversations, and giggles of my children. I am thanking him for the beautiful bounty, I lean in to hug him and he kisses my cheek, and gives me a hug. His hugs are much like his voice, the kind of hug you don’t want to end, it’s strong, soft, and gentle all at once. These moments are always followed by the words, “Gramp loves ya”. and I loved him. Not all pumpkins are created equal. Those large 20 lb pumpkins that are perfect for carving, may not be your best choice for pie making. They can have a stringier texture and the flavours may not be as strong as you would like. 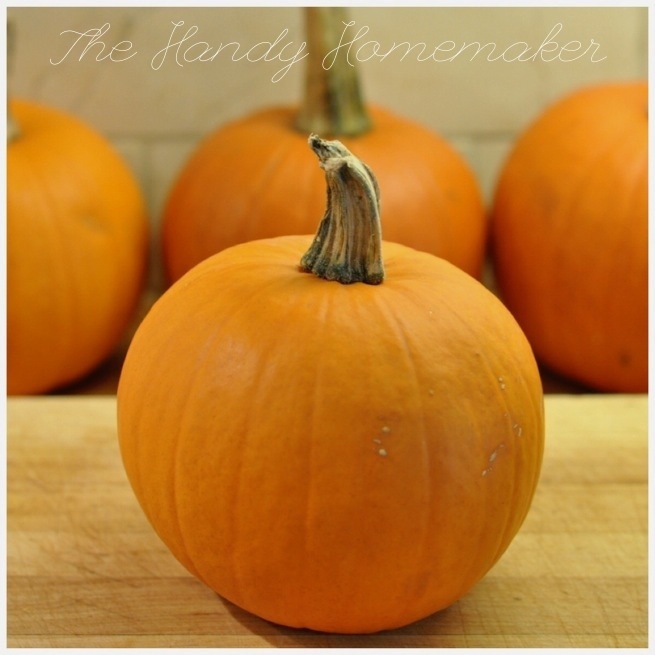 The best pumpkins for baking are Sugar pumpkins, they are often labeled pie pumpkins. A few other pumpkin varieties that work well for baking include Baby Pam, Fairytale, Autumn Gold or Cinderella. All of these have the consistency and flavour needed for baking. I use my trusty melon baller, but a spoon or scoop will work just fine. 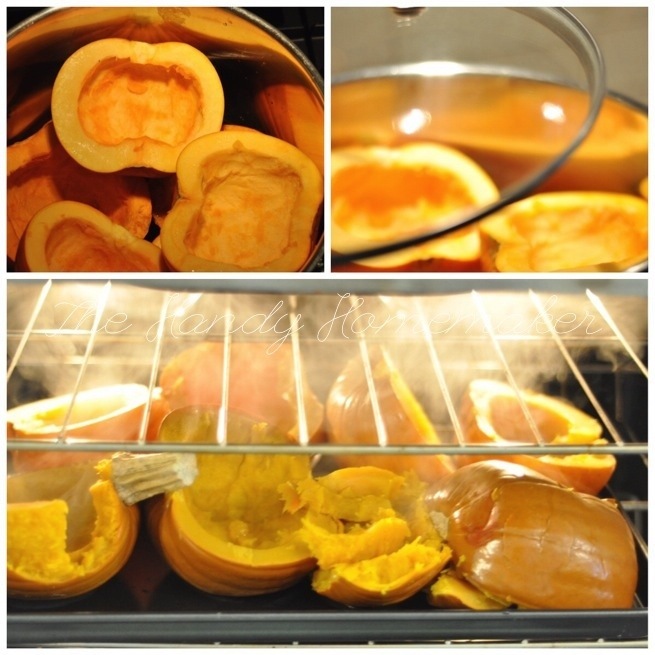 Place the pumpkins in pot with approximately 2-3 cups water. I have a wire rack that I place on the bottom of my large pot. This keeps the pumpkin from burning. Allow to steam with the lid on for approximately 30 min until softened. Remove the pumpkin and place on a baking sheet. Remove from oven and let cool until cool enough to handle. 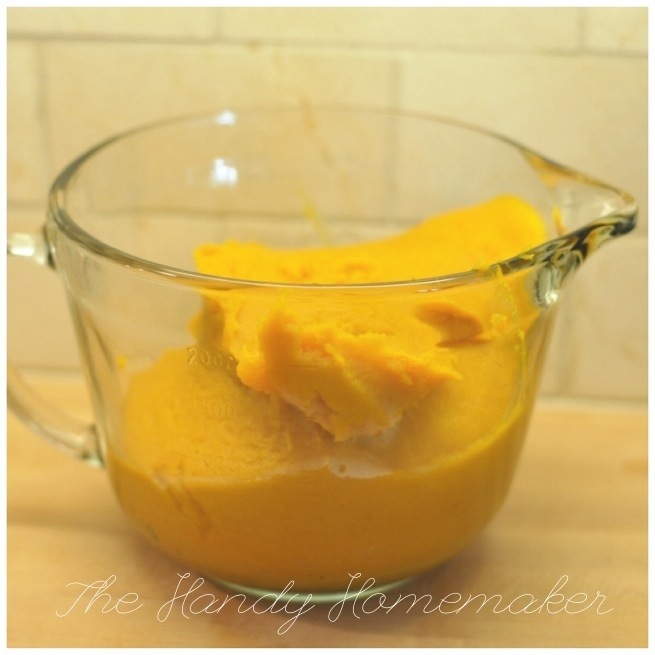 Add the pulp to a food processor and puree until smooth and thick. 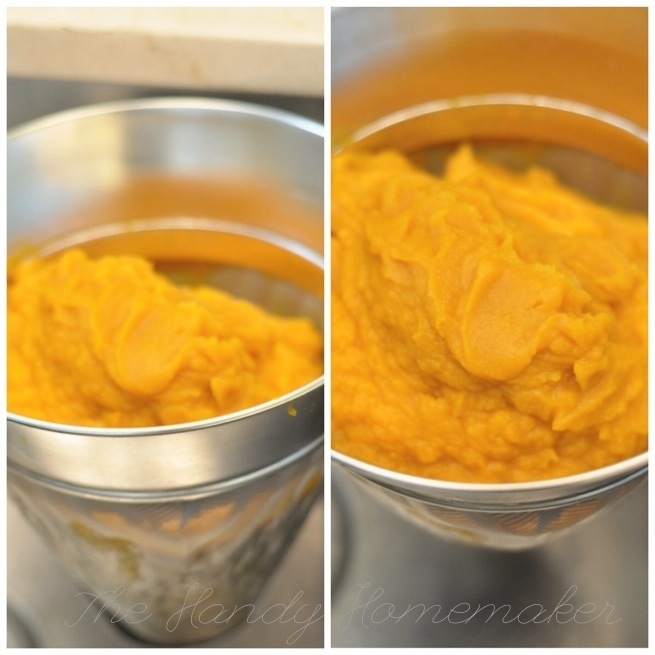 The trick to making pumpkin puree is to let the puree drain in a colander to remove excess water in the puree. My colander handles are able to hook to the sides of my sink. You can also set your colander over a large bowl and let drain. Let drain for an hour or longer. You will be able to see the difference in how thick and smooth your puree is. 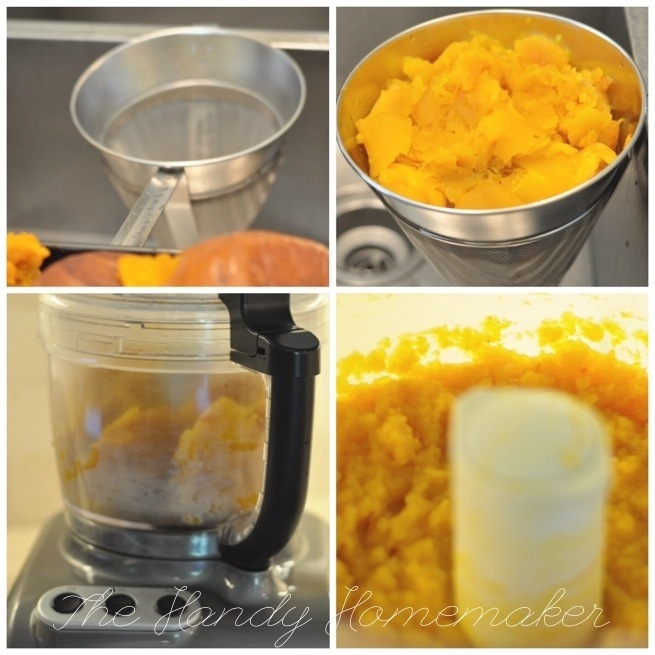 My pumpkin pie and pumpkin bread recipes both call for 1.5 cups of puree. I freeze any leftover amounts of puree in measured containers to use for future use. 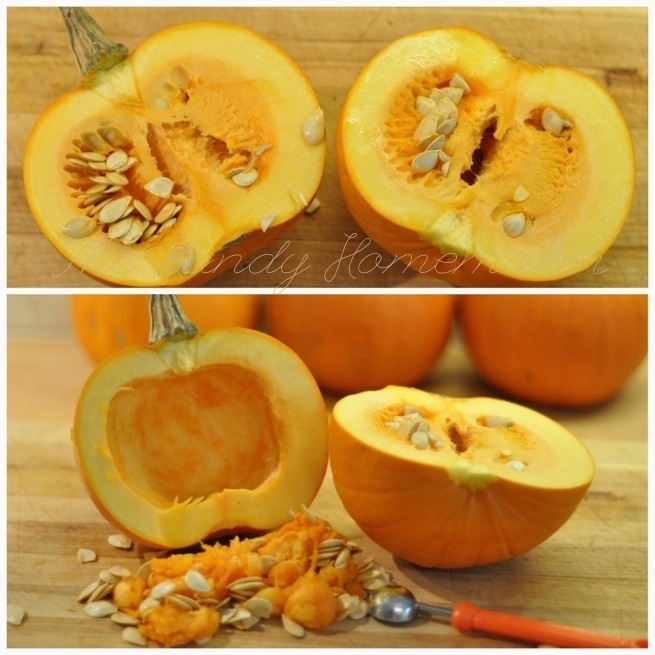 Butternut or Buttercup squash can be used as a replacement for pumpkin in pies and bread. I find there is very little difference in flavours between the two in baking dishes. A beautiful story to accompany a great recipe. Great writing!